Oedipus at the Vahktangov Theatre, Moscow. Photo: Vahktangov Theatre. The Russian-language press thoroughly covered Oedipus Rex by Rimas Tuminas after it opened in the ancient Greek city of Epidaurus (29 July 2016), and after its Russian premiere at the Vakhtangov Theatre in Moscow on the day of the company’s 95th anniversary (13 November 2016). Almost a similar “boom” in newspaper publications occurred in November 2013 after the opening of Eugene Onegin at the Vakhtangov; it seems that almost every Moscow periodical with an arts section published an article dedicated to this production. Most recently the critics’ attention was once again drawn to Oedipus; the Vakhtangov Theatre revived this play—the last production by Tuminas in the 2016-7 season—to open its new season on 6 September 2017. Apparently, the life of this production is still very dynamic; from one performance to another, Oedipus changes tangibly and still has a strong impact on the audience, including those who saw it a number of times. The life of this production is worth remembering, discussing, and covering in the press, today and in the future. The goal of this article is modest: to share some of the impressions of a witness and participant of the creative process, from the emergence of the concept of Oedipus Rex to its performances in Russia. In fact, there were two productions of Oedipus Rex by Tuminas in 2016. The first one opened in July in ancient Epidaurus, and played there only twice, in compliance with the rules of the Summer Festival in Greece, then once in September, at the Odeon of Herodes Atticus in Athens (the second performance had to be cancelled because of the heavy rain). That Oedipus remained in Greece, preserved only in a video made by the National Theatre of Greece: it was shot on the day of the first premiere—29 July—with multiple cameras and edited by Greek filmmakers. This production might be revived in the future if the decision is made to show it again on the open stage of an ancient theatre, be it in Greece, Italy, Israel, or some other country. Within the orchestra of the theatre in Epidaurus, the production can be performed only twice: there have been almost no exceptions to this rule throughout the history of the Summer Festival in Greece. Perhaps the only exception was the legendary production of The Birds by Aristophanes directed by Karolos Koun: it was performed several times—in Epidaurus, and within the orchestra of the Odeon of Herodes Atticus in Athens—because of its exceptional importance to the theatre culture of Greece. The second Oedipus was created specifically for the stage of the Vakhtangov Theatre in the fall of 2016, prior to the Moscow premiere. It was this production that the Moscow and St. Petersburg audiences saw. Lots of things were added to the first Oedipus which opened in Epidaurus. Firstly, never before had a Russian theatre company opened a production within the ancient orchestra in order to perform the premiere there, in Greece, in front of an audience of thousands. Before 2016, the most notable performance by Russian actors on the stage of an ancient theatre was the Russian production of The Oresteia directed by Peter Stein which toured Epidaurus in 1994. However, The Oresteia was produced within the framework of the Chekhov International Festival at the Theatre of the Russian Army in Moscow; the ancient theatre space was not its essential element, but only an episode of its existence. Secondly, never before had a production with Russian actors featured a Greek chorus. In the past, slightly different things happened; in 1961, in the Mayakovsky Theatre’s production of Medea directed by Nikolai Okhlopkov on the stage of Tchaikovsky Concert Hall, the role of Medea was several times performed by Greek actress Aspasia Papathanasiou, who came to Moscow specifically for that purpose. 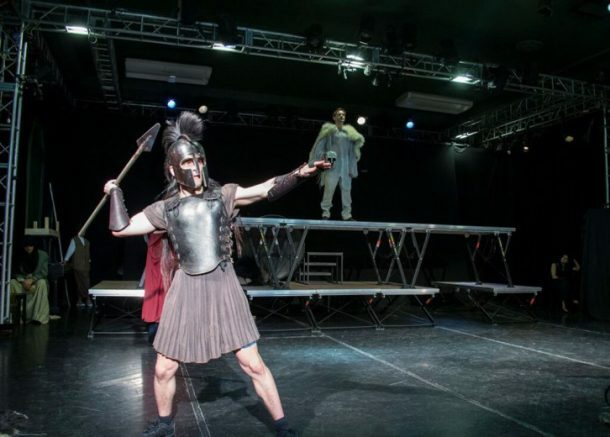 The current production of The Bacchae at the Electrotheatre Stanislavsky in Moscow is performed by Russian actors with the participation of the Greek director, Theodoros Terzopoulos, who in the final scene performs a Greek lament song. Oedipus at the Ancient Theatre of Epidaurus, Greece. Photo: Vahktangov Theatre. 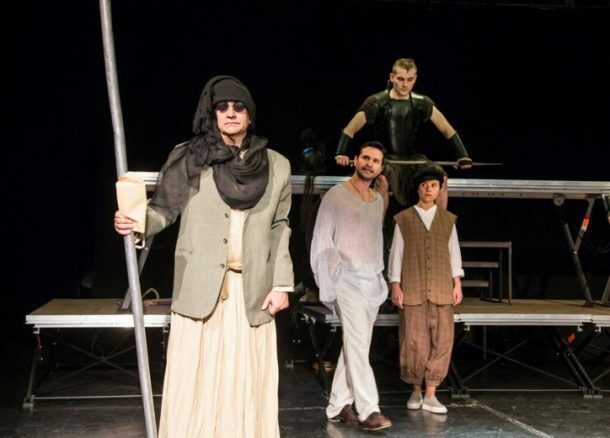 The idea to invite a Greek chorus to participate in the production and to make Oedipus a joint project of the Vakhtangov Theatre and the National Theatre of Greece emerged immediately, during the initial discussions of the production in the winter of 2016. Of course, it certainly helped that 2016 was the year of Russia in Greece, and Greece in Russia. However, the main reason for bringing the Greeks and Russians together was different; Greek culture is the only one to be endowed with practical knowledge about the chorus in drama, and theatre in Russia or Lithuania has no source from which to draw this knowledge. European drama actors started to perform within ancient orchestras as early as the late nineteenth century. The Comédie-Française actors were the first to try their hand at performing in an ancient Roman theatre at Orange in the South of France. Then, in 1911, at the arena of Circus Schumann in Berlin, Max Reinhardt produced his famous Oedipus, featuring a chorus of several hundred people. Later, in Italy and Greece they would hold festivals on ancient stages. However, regular work with the chorus within the orchestra started no earlier than in 1938 when celebrated Greek director Dimitris Rontiris, assistant and student of Max Reinhardt, was the first in Greece to direct a production in Epidaurus with actors of the Royal Theatre, which became the National Theatre of Greece. Performances by Greek actors in Epidaurus and Athens happened more and more often, and in 1954 they grew into a regular Summer Festival, where Greek companies would annually present ancient plays, and every year the chorus would perform within the orchestra. Actually, what is the chorus? What is this group of 12 people who are collectively referring to themselves as “I,” not “we,” who are constantly present on stage—from time to time reacting to the actions of solo actors—and who in the breaks between episodes perform collective parts, sometimes taking the form of recitatives, songs, or even ecstatic exclamations? That has been thoroughly discussed by the 20th century scholars; however, in the National Theatre of Greece there is a practical concept of the chorus, drawn from ancient texts and tested in practice multiple times. The concept is passed from one director to another; actors are also familiar with it. I learned about it from director and composer Thodoris Abazis, deputy artistic director of the theatre and creator of the choral parts in Oedipus Rex. The chorus, according to this concept (and the chorus, in accordance with ancient rules, consisted of 12 or 15 people), is the audience, the members of which are allowed to go to the orchestra and act in compliance with the tradition, embodied in the text of the drama: to comment, evaluate, agree or disagree, answer, or actively react to every element of action. That is why the chorus’s conventional location during the work of solo actors is close to the seats of the audience, often along the orchestra’s curve, becoming, so to say, the first row of the auditorium. That is how the union of the chorus and the audience was marked. The Greek Chorus. Photo: Valery Myasnikov. The chorus’s words sound like statements, anticipating the audience’s reaction; the chorus “orchestrates” the audience’s mood and emotional experience, directing and amplifying them, plotting the vector of the their emotions, and harmonizing (i.e. putting into words and music) strong feelings, inspired by the action. In order to perform their parts between the episodes, the choreuts enter the orchestra, thus breaking away from the audience and facing it. Now the chorus talks to the audience directly, contemplating in front of it through songs and, of course, appealing to gods; in ancient times tragedy was performed only during sacred rituals, therefore the sacred images of gods (Dionysus, in the first place) were placed near the orchestra. Of course, some skeptics might have reservations about this interpretation of the chorus as an audience member acting on stage. For instance, in the works of Euripides the majority of choruses are women whose origin is far from aristocratic (as well as in The Choephori by Aeschylus); it is hard to imagine that the Council of 500 in Athens, as well as other male audience members, could have been able to identify with these women. However, the fact that this concept is understood by the actors, accepted by the audience, and may be applied in practice in a variety of ways, has been proved many times by the productions of Greek companies on ancient stages. In Oedipus the chorus, according to Sophocles, consists of male citizens of Thebes, feeling all the hardships of the terrible pestilence which befell the city. Therefore, in the production by Tuminas, during their first entrance they trudge, exhausted and holding onto each other; someone falls to the ground, breaking this sad row, but others instantly help him to get up, because the Thebans are used to such fainting. For the costumes Tuminas drew on the aesthetic of “gangster” world, as if borrowed from the movies about the 1930s Chicago: black suits, waistcoats, white shirts, and fedora hats. All the choreuts are undoubtedly devoid of any gloss not only because there is pestilence in the city; for them these costumes are, so to say, casual. They are used to wearing them in everyday life. “Chicago” as the aesthetic reference point for the chorus is a sudden insight of Tuminas which has proven itself totally right. First of all, the Greeks—bearded and emotional in a southern way—look very colorful in these costumes. Secondly, the aesthetic is justified by action; the chorus consists of Oedipus’s confidants, witnesses of all of his conversations, interrogations, meetings, as well as Oedipus himself—played by Victor Dobronravov. The King’s hot temper, fury, demands for absolute submission, and readiness to begin shouting at any minute to start a fight or sentence someone to death, sometimes resembles the “kings” of gangster world. However, the chorus can never serve as an instrument for the hero to realize his intentions; that is impossible in ancient tragedy. Thus, on the one hand, the chorus is a part of Oedipus’s world; Coryphaeus, the character created by Vitalys Semenovs, is his constant confidant, often rather bold and straightforward. 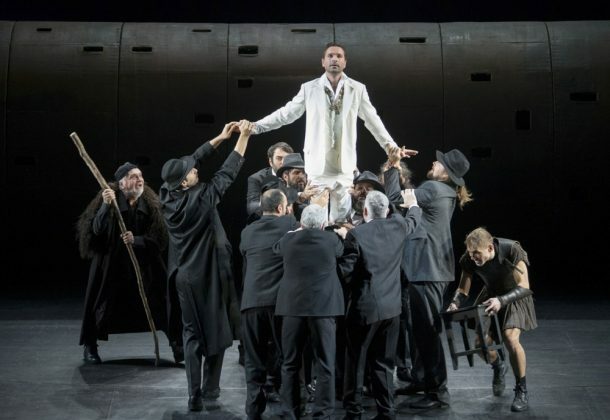 However, the concept of the chorus as a part of the bulk of the audience was also realized in the production; this was especially noticeable at the opening in Epidaurus. When Oedipus appeared in his royal attire, the choreuts, shocked, would fall on the ground and listen to their king, sitting with their backs to the audience and forming a semicircle (similar to the semicircle of the orchestra), as if the first row of the auditorium had been transferred onto the stage. Prior to the final episode, the choreuts exited the stage, went towards the audience, and sat just a step from the first row, right on the stone floor of the theatre, following the curve of the orchestra, with small gaps between one another, to watch the final scenes. Lyudmila Maksakova as Iokasta. Photo: Valery Myasnikov. In the Moscow production of Oedipus this aspect of the chorus’s existence was less noticeable. Raised stage and portal arch divide the stage from the auditorium, therefore when the chorus falls on the floor in order to listen to the king’s solemn address to the city, this mise-en-scène no longer gives the audience a chance to feel the visual and emotional proximity to the chorus as fully as it did in Epidaurus. Prior to the final episode, the chorus went backstage, and not to the auditorium. This is the only way it could happen, because on the black box stage the laws for tragedy are different than on the open stage; here the action has to be more autonomous, wholesome, and condensed. However, recalling the open and free interaction between the performers of the tragedy and its viewers in the ancient, open-air theatre, Tuminas begins the production at the Vakhtangov with house lights on. When the chorus enters the stage, some actors sit on the chairs, placed on the left and right along the wings, and look intently and curiously at the audience, as if making it clear that the portal arch is fully transparent and permeable, so that the look from the stage enters the auditorium as freely as the returned gaze. And when the lights in the house slowly dim, the actors continue hypnotizing the audience, appealing to its members as if they were “the citizens of Thebes,” so the members of the audience have a role in the production anyway. Still, given the circumstances of the black box stage, instead of visually bringing together the chorus and the audience, the creators of the production put more effort into emotionally gripping the audience through the action of the chorus, which descends very easily from the stage to perform from the auditorium. We should admit that at the Vakhtangov Theatre this worked even better than within the orchestra in Epidaurus. The strong emotional impact of the chorus in Oedipus is first of all determined by the fact that very powerful Greek actors have participated in it from the very beginning. It is not a secret that in Greek theatre culture, as once in the ancient world, the choreuts were never placed on the same level with solo actors; at that time the tragic contests (and awards) were only for solo actors and never for the chorus. When in the National Theatre of Greece there was a casting call for the chorus of Oedipus, there were over 150 candidates for only 11 places. Eventually, the majority of the chorus participants could have been promoted to principal roles because of their maturity, high professional reputation, and enviable resume. However, they were motivated only by their enthusiasm for this joint Russian-Greek production, the Vakhtangov Theatre, and, of course, the director, Tuminas. (By the way, 4 of the 11 actors even spoke Russian because of their connection with Russian theatre schools). Many theatre people in Greece admitted that this was by far the strongest performance of the chorus in a tragedy that they could remember. Rehearsal of Oedipus at the Vakhtangov Theatre, Moscow. Photo: Vahktangov Theatre. Thodoris Abazis, who wrote the chorus’s parts, created a complex combination of declamation, recitation, melo-declamation, and singing (unisonant and part-singing) without using musical instruments or a sound record. This combination is based on the pace, set, first of all, by breathing. The impact of a rhythmic sound, in which one can distinctly hear the energetic and powerful breathing of a group, turned out to be very impressive; the phonetics and melodics of the Greek language helped a lot. The composer, similarly to the director, interpreted the tragedy as the place where all kinds of emotions manifested themselves: not only fear, sadness, and anxiety, but also joy, enlightenment, and triumph. The promise of the unilateral exultation is heard in the third choral song, in which the choreuts, praising Oedipus, are waiting for the prompt revealing of his birth; they have no doubts that he was born to one of the immortals. That is how the genuinely Greek chorus of Oedipus Rex was born, the first Greek chorus in Russian theatre whose presence in the tragedy was instantly perceived by the Russian audience as a necessary, naturally legitimate, and integral element of the stage action—from the very first performances in Moscow. Starting the rehearsals in Moscow, Tuminas suggested that the Vakhtangov actors should create interactions between one another through fight and exchange of “blows”—in words, gestures, and the state of mind—hence the particular emotional tension and overexcitement of almost every dialogue in Oedipus. As early as in the first monologue of the Priest (Evgeny Kosyrev), when there is a plea to Oedipus to save Thebes, we can distinctly hear the notes of reproach addressed to Oedipus—where are you and why haven’t you yet done anything? And the first line of Oedipus after coming to the Priest: “Known, ah, known too well…” also reveals dissatisfaction and irritation. Anger, headiness, and propensity towards conflict have led him to kill his own father, to feud with the prophet Teiresias, and later with Creon. As the famous saying of the ancient Greek philosopher Heraclitus goes, “Character is destiny.” It probably means that, when man goes through the crucible of life, when the mind isn’t fast enough to follow statements and actions, then character takes over man (which also means passions, imposed by nature). Character sends the strongest life impulses; it leads man through life, thus mapping the line of fate. Victor Dobronravov captures this characteristic feature of Oedipus very precisely; an angry and heady temper has got the hold of his soul and adds belligerence to every conversation. That is how Sophocles saw Oedipus and that is the basis of his character in the production by Tuminas. That is why, whenever Oedipus enters the stage (as he does in every episode), there is a collision, confrontation, or fight. His first opponent is the blind prophet Teiresias, who doesn’t want to reveal the truth about Oedipus instilled by Apollo. In this production, the role of Teiresias belongs to Evgeny Knyazev. I noticed that in the majority of performances of Oedipus Rex (in Epidaurus, Athens, Moscow, and St. Petersburg) the first applause of the audience is heard exactly after the first episode, when the confrontation between Oedipus and Teiresias reaches the boiling point; Oedipus is ready to stomp the rebellious prophet to death, in response drawing his ire, and is especially fearsome because the gods side with him. In fact, in Epidaurus it is uncommon to applaud before the end of the show. However, the audience inevitably applauded after the episode with Oedipus and Teiresias, and again after every episode, and after several appearances of the chorus. The farther from Epidaurus, the more the character of Teiresias, created by Evgeny Knyazev, is filled with cunning, irony with a smirk, and pinch of madness—often present in depitions of prophets. This prophet managed to confuse everyone. At first he said that he was going to keep mum, and then suddenly he declared Oedipus the main culprit; at first he declared that he wanted to leave soon, and then, getting angry with Oedipus, delivered a long monologue in which one could hear either prophecy or condemnation. Eventually, he went away with a smirk, leaving Oedipus alone with the news, which may have come either from Apollo or from an insane old man. The next confrontation is between Oedipus and Creon. The role of Creon is performed by Eldar Tramov, a young actor of the Vakhtangov Theatre studio. Tuminas is the first director to see in Creon not as a grown man or as a revered old man, but as a young man—a peer of Oedipus or someone even younger. Thus the potential for conflict has been maximized, as collision between peers, whose positions in the royal house are relatively equal, with fewer moderating forces than struggles between people with big age differences. At the beginning of the play, Tramov’s Creon is the total opposite of Oedipus; he is lenient, weak-willed, enthusiastic, affectionate towards everybody and everything, and in adoration of his place in the royal house next to his sister Jocasta. Without lifting a finger, Creon can rule the city and enjoy the benefits of the royal house, and therefore is quite self-sufficient. That is how he looks when we first see him, on his way from Delphi, in the prologue. Here we can sense the brewing confrontation between him and Oedipus, which is not obvious but implied. Creon is laid-back and self-assured (Tuminas gave Tramov a clue that in Delphi they had already promised Creon that he would soon ascend to the throne); Oedipus is irritated by Creon’s mannerisms and even by the sheer presence of his wife’s brother. Like many kings, Oedipus suspects that his brother-in-law covets the throne. In the second episode, Tramov conveys a sharp change in the manner of Creon’s behavior. It seems that for the first time the royal son does not look laid-back anymore, but rather fears that he is going to lose not only his position, but his life. He both believes and does not believe that he can die. Here he looks a bit like a holy fool; by hook or by crook he is holding onto his life, looking for support from everyone around him (the chorus, the audience) so that they could also persuade Oedipus that Creon is good and not guilty. In the second to last episode, there is another collision, this time between the messenger from Corinth and the herdsman from Thebes. In Epidaurus and Athens, the Corinthian was performed by Valery Ushakov, and the Theban by Artur Ivanov; in Moscow, the cast of Oedipus was joined by Oleg Forostenko (the Corinthian) and Ruben Simonov (the Theban). I do not remember any other production where the director managed to reveal the war between the two messengers of Sophocles so convincingly, or where the actors conveyed it so impressively. The Theban wants to hide the truth about the baby with broken ankles, which the Corinthian is trying to reveal. The Theban knows that the truth will bring woe, the Corinthian is, on the contrary, positive that the truth will bring happiness to everyone and an award to him. The Theban has forever blamed himself for not being able to kill the baby (when asked why, he shouts in despair: “Through pity…”); the Corinthian, on the contrary, has always been happy as a result of his giving the baby to the house of the Corinthian king and deserving an award. 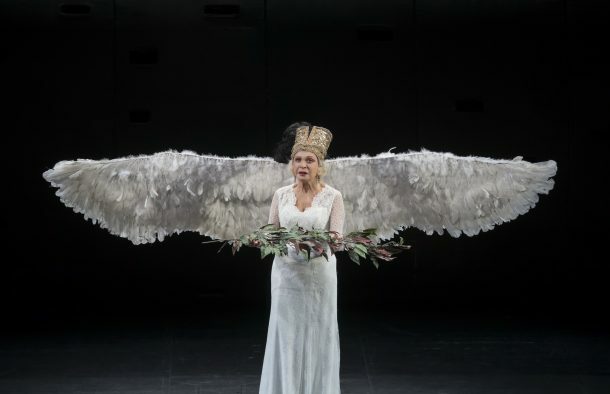 Only one character of the tragedy remains outside the battle: Jocasta, the wife and mother of Oedipus, a character created by Lyudmila Maksakova. When she first appears on stage (in the second and longest episode), Jocasta tries not to wage war, but to make peace between Oedipus and Creon. In a conversation, Tuminas confessed that it is Jocasta who is the main character of his story. Jocasta is depicted as a strong and wise woman, mother, queen and patroness of the royal house, and the closest friend and advisor to her young husband and her young brother. Indeed, it is in Jocasta that Oedipus and Creon find strength and confidence; it is she who is the pillar of the kingdom. Jocasta, in this production, is never happy, for she has suffered the utmost hardships which can befall a woman: the loss of a newborn child, the loss of her husband, the fatal disbelief in the justice of gods, and the suffering that from that disbelief. Only once does she utter an exclamation which sounds like an expression of happiness, when she hears that Polybus (whom Oedipus considered his father) died, which means that the prophecy about patricide failed. Yet even this exclamation is mixed with bitterness, for what can be joyful in the fact that the gods lie? Their lies put into question the very existence of truth in the human world. The conversation with the Corinthian herdsman has led her (earlier than Oedipus, because she is wiser) to the discovery of the terrible incestuous relationship—her marriage to a young husband which gave her temporary hope. This discovery was followed by the verdict—“Put to death!”—which she pronounced to herself. In listening to the ending of the herdsman’s monologue and bidding farewell to Oedipus by promising to be “silent evermore,” she immediately enforced the verdict without hesitation. The composer for the production, Faustas Latenas, composed a splendid musical theme for Jocasta. It has beauty and yearning for flight, but at the same time, deep sadness and hopelessness, as if a man inhaled, flapped his wings and started towards the sky, but this was instantly followed by an exhale, accompanied by the understanding that the wings refused to fly, for there was not enough strength. One more flap—again no strength. Once in the performance this melody is performed by Oedipus; at the end of the chorus’s part following the second episode, he paces the stage, playing the saxophone, and the chorus picks up the tune. This happens right after a statement by the chorus that both in the royal house and Thebes there is disbelief in gods: “Apollo is forsook and faith grows cold.” Soon we will learn from Jocasta that it is Oedipus who is restless because he anticipates woe. Jocasta’s theme serves as the musical symbol of this premonition and becomes the theme for Oedipus, and the leitmotif of the entire production. Rehearsal of Oedipus at the Vahktangov Theatre, Moscow. Photo: Vahktangov Theatre. Before singing along with Oedipus, the chorus members put on military helmets, covering their faces. The chorus’s helmets and their action of singing with Oedipus’s saxophone were both introduced specifically for the Moscow production. Helmets replace masks, behind which the choreuts seem to be hiding from their own disbelief and shame, from their own unwillingness to stay in the chorus and sing, addressing the gods, who, according to the kings, lie. A few seconds before the saxophone, the chorus angrily reproaches the tyrants for their pride in front of the gods, and the choreuts are almost ready to dissolve and leave the stage in order not to praise the proud men—a witty reaction by Tuminas to the line: “If sin like this to honor can aspire, why dance I still and lead the sacred choir?”. Then they sadly get back together, and in order not to become proud men themselves, put on their helmet-masks and start singing along with the tune played by Oedipus. The choreuts see disbelief in themselves; through them the whole city is filled with the mood of despair, anticipation of woe, shame, and a desire to hide from the gaze of heaven. The beautiful tune of Latenas reminds more of a former beauty of a life which will never return. The music and sounds created by Latenas deserve special mention; they play an important part in the success of Oedipus Rex. It was noted long ago that Tuminas’s productions are musical, and musicality is their inner, essential feature. Director Tuminas and composer Latenas share this musicality of thinking; their long-term co-creation in theatre is not accidental. In Oedipus, as in their previous productions, all their meaningful accents are musical, the periods of stage action are similar to musical phrases, the dynamic of action is picked up by music, and the dramatic turning points are accentuated with the intrusion of a sound composition. Almost every sound on stage becomes an element of the show’s monolithic musical palette. Two musical themes define Oedipus: first, the aforementioned theme for Jocasta, and second, the theme of the loud, “beastly” breathing of fate, taking an active part in the life of Oedipus and the members of his household. The set designer of the production, Adomas Jacovskis, created an impressive physical embodiment of “the machine of fate,” a topic thoroughly covered by critics and journalists. It is a giant cylinder with small square holes along its surface, relating to a huge clock mechanism, a mammoth music box, or probably an execution machine that will crush flat everyone who is doomed to lie under it. The “beastly” breathing and heartbeat of this machine was shaped by Latenas into a powerful musical and rhythmic theme—exhaling smoke, restlessly swinging and at the end rolling towards the auditorium and almost reaching the footlights—which is heard more and more often as the show approaches its conclusion. The image of an object of fate that rolls over the people is highly characteristic of the artistic world of Tuminas and Jacovskis. In 1997, in The Masquerade of the Small Theatre of Vilnius, the image of a growing snowball was introduced. It was supposed to crush the main character at the end. 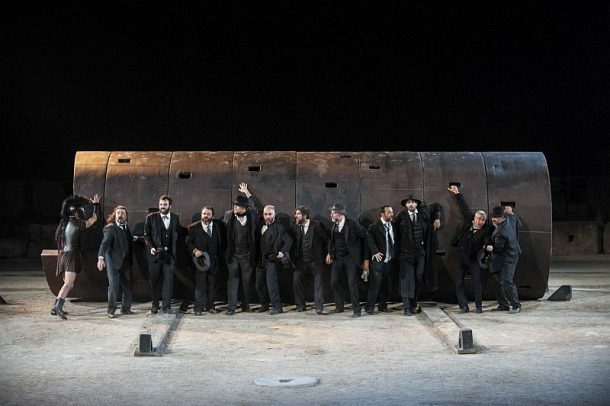 In 1998 in Oedipus in Vilnius that very “machine of fate” was also in action—a cylindrical pipe with square holes, but of a slightly different shape and smaller size than what was needed for the orchestra of Epidaurus and stage of the Vakhtangov Theatre, which are much larger spaces. In 2001, in Vilnius, at the National Theatre of Lithuania, Inspector General opened, in which a giant “church” with a small cupola flew over the stage. It was made in a simplified manner and therefore resembled blind pagan dolls; it was swiping away every trouble the people stirred, and moved towards them as a giant ghost, but they still failed to notice it. Therefore, Oedipus Rex, from the scenographic point of view, is on one hand a reminiscence of the productions by Tuminas and Jacovskis from the turn of the twenty-first century. On the other hand, “the machine of fate,” embodied by a pipe, rolling towards the actors and audience, is an impressive symbol of doom in our time, as well as an object that fits into both the open stage and the black box stage. In both Epidaurus and Athens, the technical conditions of the stages did not allow for the giant pipe “roll over” the first row of the audience, so that the whole auditorium could feel the doom heavily hanging over it. However, this worked marvelously on the Vakhtangov stage. Therefore, the ending of Oedipus became famous and already left a mark in the history of contemporary theatre: two girls in white dresses—Oedipus’s daughters, Antigone and Ismene—are trying to escape the terrifying roll, running towards the footlights and attempt to roll it in the direction of the backdrop, but it advances anyway. When the girls run away in fear, “the machine of fate” goes fully into effect; it freely rolls over the audience, swings, emanates smoke, breathes loudly, and one could hear a giant heart beating, which sounds either like a threat or like the guarantee of life. The “machine of fate” brought Oedipus to stage twice: in the first episode, when he, solemnly put his hand on a staff and gave a loud promise to spare the city of abomination, and in the last episode, when Oedipus, broken by woe and turned into an old man, with both hands on the staff as his only support, delivered his farewell monologue before exile. Victor Dobronravov splendidly conveyed this change in Oedipus through the means of acting: from the stately king in full attire at the beginning (who seemed huge), to the frail old man in a canvas robe at the end. It seems that he has downsized two times, lost body volume, slumped and “shrunk” because of the hardships befalling him. This very “machine of fate” brought towards the backdrop the characters who held onto it with one hand, as on a rack: Oedipus before the final monologue and the member of Oedipus’s household telling what happened in the house after Oedipus discovered Jocasta who had hanged herself. Viktor Dobronravov as Oedipus. Photo: Valery Myasnikov. Maksim Sevrinovsky, an actor of the Vakhtangov Theatre studio, plays Sophocles’ Messenger, interpreted by Tuminas as a member of Oedipus’s household. Normally, directors bring the Messenger to stage precisely at the moment when the audience needs to be told how Jocasta hanged herself and Oedipus stabbed out his eyes. In this production, the Messenger, who delivers the monologue at the end, appears at the very beginning of the show as a silent character. As the majority of Thebans, he is fatally ill, his face is covered with a bandage; he is a reminder of the pestilence that befell the city and is inevitably getting to the royal house. Sevrinovsky’s monologue, permeated with the feeling of horror caused by current events, is handled through the physical conveying of visual images that were witnessed by the Messenger; in describing how Jocasta hanged herself, he tightens the band near his neck; in speaking about the blinding of Oedipus he uses powerful and energetic gestures to show how Oedipus stabbed himself in the eyes multiple times. Closer to the ending of the monologue he removes the bandage and reveals huge, blind eyes in black caves. We can hear the loud, intermittent breathing of a man, who is inhaling for the last time before his death. This is an impressive precursor to the final monologue of blinded Oedipus. Tuminas, as it is customary, introduced a number of characters, who were not among the original dramatis personae. Those include the Soldier (Pavel Yudin, actor of the Vakhtangov Theatre studio) and the Lady with the Wings (Ekaterina Simonova), who both live on the stage from the first moments of the production. The Soldier is the instrument of Oedipus’s vindictive plans and threats: his endlessly faithful dog; the guard of his house, tirelessly running in circles (this running around the orchestra marked the beginning of the performance in Epidaurus); a threat to the enemies of Oedipus and participant in his bullying of Creon (Oedipus jokingly crowns the Soldier with Creon’s golden wreath when he wants to execute his brother in law); and eventually, the king’s most loyal subject, crying more than others, when the entire truth about Oedipus is revealed. The director and actress created the character of the Lady with the Wings, inspired by the image of the Sphinx, which was defeated by Oedipus. According to the myth, Oedipus solved her riddle, thus facing deflecting threats from Thebes, and the Sphinx ended her life by jumping off a cliff. Tuminas, true to his manner of posing non-conventional questions to traditional tales (“and what if it did not happen this way…”), made an assumption that Sphinx had not died, instead becoming a captive and servant in Oedipus’s house, always accompanying the queen, Jocasta. As a result, they came up with an image of a girl with huge wings: raven-haired, with deep black eyes, and beautiful in a strange, exquisite way. She flaps her wings—at times black, at times white—but it is understood that she will never take off again. Because of that, her beauty is combined with sadness, as in Jocasta’s musical theme. Ekaterina Simonova’s movements are smooth and harmonious, as a ritual dance, but she often bends down in a gesture of submission, folding her wings behind the back. Here we see the image of power and beauty, going beyond all human capabilities, and yet defeated by man, living joylessly like the rest of the people in Oedipus’s house. In Oedipus of the Small Theatre in Vilnius (1998) there was also a winged maiden. However, she was more like a small white angel and her image was more ironic than filled with sadness caused by beauty in captivity. Generally, in the Lithuanian production there was much more irony, laughter, and more props; they had a big figure of a tiger, and the manner of communication between the characters was closer to prose than to poetry. The Lithuanian production had success, and performed in Russia, too, where it played at the Baltic House festival. This makes it especially interesting to compare the two versions of Oedipus in Vilnius and Moscow. Firstly, the scenography of the Moscow production was “cleaner” and more reserved. 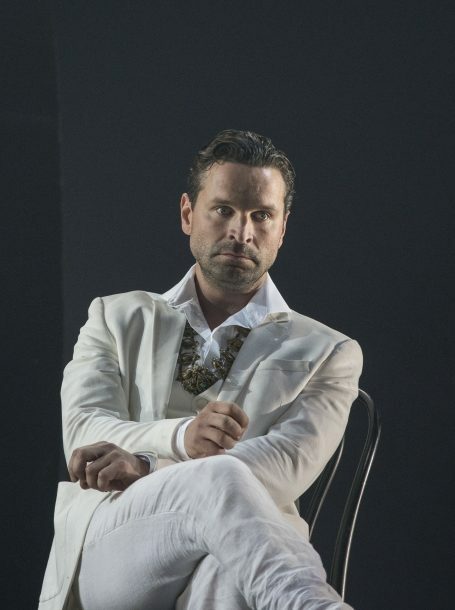 Secondly (and perhaps most importantly), in Oedipus at the Vakhtangov there was much less irony than in the Lithuanian version; its structure has become simpler, it is now much more serious, in the tradition of classical tragedy. Of course, even in this version there were moments when the director and actors found humor appropriate. For instance, for some reason Creon is late on his way back from Delphi, and the audience feels some kind of a funny fear—how long is the delay going to be? (They do not have to wait for long.) During the second episode, Creon, maddened by anticipation of execution, which Oedipus threatened him with, suddenly and desperately bursts into singing a popular Greek song about love “Eim’ aetos choris ftera / Choris agapi kai chara” (“I am an eagle without wings/ without love and joy”). Or the moment, when the chorus, condemning the tyrants and flying into a rage caused by righteous anger, suddenly leaves the stage, refusing to continue its performance. After hearing that, the audience in Epidaurus burst into laughter, because for a moment it seemed that the performance, which had sold 7000 tickets, could be suddenly interrupted before the ending. These moments, however, do not distract from the most important thing: creators of the production managed to achieve the incredible seriousness and acuteness of tragedy—a seriousness unheard of and forgotten these days. In the era of the “post-” (postmodernism, postdramatism, postculture, metatheatre, etc. ), it sometimes seems impossible to hold the audience’s attention without tricks, jokes, and laughs. The ancient tragedy of Oedipus, with its themes of human dignity, responsibility for crime, crisis of belief in the divine, helplessness of royal power in the face of conscience, frightening discoveries of truth about oneself, and heroism in self-knowledge, arouses compassion and fear, as Aristotle would put it, in an auditorium with 1100 seats. 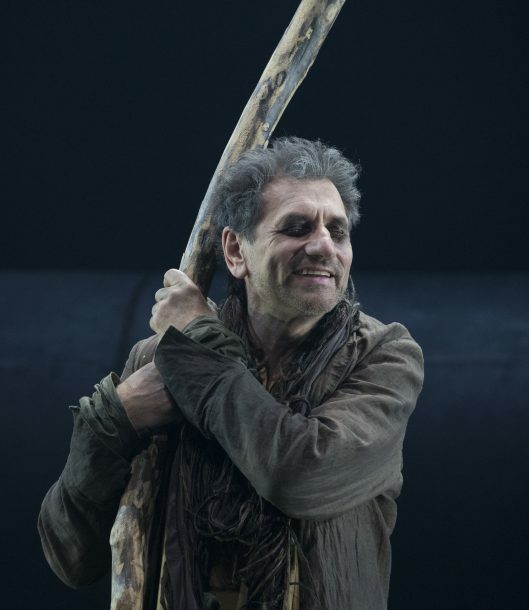 Evgeny Knyazev as Tiresias. Photo: Valery Myasnikov. Of course, a lot in the Moscow Oedipus was determined by the venue of the first performance in Epidaurus. 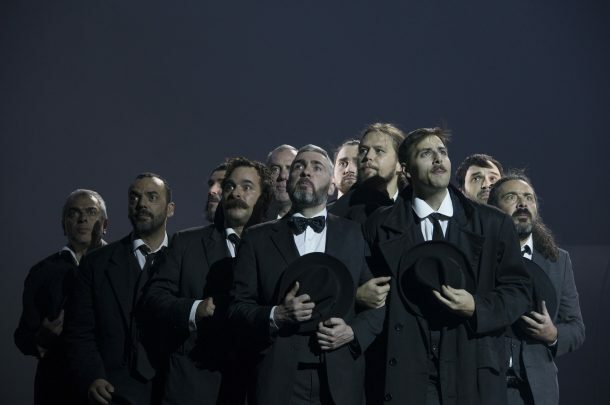 The Moscow audience might get a sense that all the Vakhtangov actors play “with memory” of the magical land named the Argolis, with its sea, mixed with healing springs, the best oranges and olives in Greece, and with the thousands of audience members in the ancient theatre at twilight during the premiere. The Moscow Oedipus resonates far beyond the Vakhtangov theatre. The words of the actors leave the stage and go above beyond the walls, balconies, and gallery, in the direction of the place dedicated to the cult of Asclepius and Apollo, connected in our mind with material and spiritual catharsis. They play with memory of the most beautiful theatre in the world—the first theatre with an ideally round orchestra, erected in the sanctuary of Asclepius, it seems, specifically for the purpose of healing through visual harmony and magical energy. And I will remember how, at the beginning of the performance in ancient Epidaurus, two laughing girls in white dresses were running against the background of the black forest—how, accompanied by the rumbling theme of fate, huge shadows of birds, carried on high poles by the choreuts, were flying above the ground and branches of trees—how the grove surrounding the theatre in Epidaurus, was alive with sound, because Tuminas and Latenas made a witty decision to put the speakers close to the trees behind the orchestra—and finally, how at the very end of Oedipus a complete blackout occurred. The only light reaching the people, was coming from the stars in the night skies: therefore all the thousands of people in the audience—in those several seconds of silence before the final applause—raised their heads up to the sky. English translation by Anna Shulgat. Dmitry Trubotchkin (Moscow, Russia) is Doctor of Sciences in Art Studies; Head of Department at the State Institute for Art Studies; Vice-rector and Chair of Art Studies and Humanities at the Higher School of Performing Arts; Professor of Theatre Studies at the Russian Institute of Theatre Arts (GITIS). He has published extensively (in Russian, English and Italian) and presented at conferences around the world on European classical theatre and on contemporary Russian theatre. His most recent monographs, in Russian, include: Ancient Greek Theatre (Moscow, 2016); Rimas Tuminas: Moscow Productions (Moscow, 2015).